Have you ever heard someone online talking to you about ‘master and slave’ accounts, currency suffix, symbol mapping and other similar technical terms and you did not understand what the hell they were talking about? Maybe you even pretend that you know these terms, but just changed the topic of the conversation? In this business of forex, there are literally hundreds of different terms and it is important to know a lot of them to be successful. I have been working as a programmer for about 16 years now and when I created Local Trade Copier and Remote Trade Copier I soon realized that people do not know much about this copy trading thing. So I wanted to take a few minutes here to help you understand all of the key terms that are relevant to trade copying in this business. We are going to talk all about the different terms, but first let me tell you what copy trading is and what trade copier software does. A Trade Copier software is a computer program used to automatically copy or duplicate trades from one trading platform to another or from one trader’s account to another over the internet, local network, or even the same computer. Trades are simultaneously copied from one forex trading account to two or more accounts using secure file transfer protocols or HTTP protocol. This software, which comes in the form of an Expert Advisor, is installed in both trading platforms of the master and slave accounts. It will work regardless of how many master and slave accounts are connected. It has numerous features that can be configured and can be used for various purposes. An account manager trading multiple different accounts at the same time will certainly benefit from this software. He may run the software on his computer or on a VPS server and manage only one account, called the master account. All the parameters of the trades he opens on that account will be automatically copied to all other accounts, which are called slave accounts. And yes, manager can open trades on his mobile device like iPhone, iPad or Android and those too will be copied to the slave accounts if configured properly. Trade copier software comes in many forms, but there are only two main types that serves different purposes. The Local Trade Copier (LTC) software copies trades from one trading platform to another on the same computer, over a local network, or on a VPS server. Master and slave accounts are running on the same computer, on the same VPS server, or on the same local network. It is designed to run on the local computer or VPS for personal use and for trade managers that can handle multiple client accounts by themselves. This type of software is very popular and there are many different versions on the market. Below is an example of what the LTC looks like when it is applied to two charts-a master (LTC Server EA) and a slave (LTC Client EA). In contrast to the Local Trade Copier, the Remote Trade Copier (RTC) is used to manage, share, or copy trades of a master account to multiple slave accounts that are located on different computers or VPS servers. Account managers with customers in different locations around the world can send their trading signals to remotely located accounts through the internet. The RTC provides the same set of tools as the LTC and it is an all-in-one solution for signal providers and account managers. An MT4 Trade Copier, as the name implies, is a trade copier software designed for MetaTrader trading platforms only. 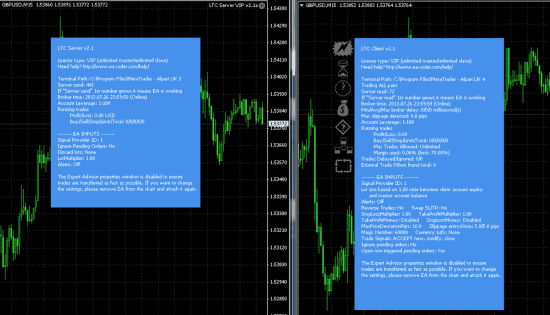 For example, Local Trade Copier and Remote Trade Copier, both are designed for MetaTrader 4 platform only. But there are other trade copier apps that are designed for MT5 or even other trading platforms. However, “mt4 trade copier” means we are talking only about the trade copiers that are designed for MT4. Compatibility issues may arise when installing this software to other trading platforms other than MetaTrader platforms as it simply will not work. 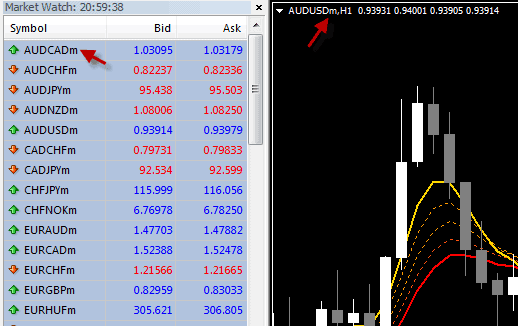 This software is installed on two or more MT4 accounts to send and receive trading signals. The sending (master account) and receiving (slave account) MT4 accounts constantly communicate data and synchronize all settings in real time. The master and slave MT4 accounts may be located remotely or running on the same computer. The MT4 Trade Copier efficiently copies exact trade parameters such as market order price, take profit, and stop loss levels. Any trade adjustments or modifications in the master account are automatically executed at the slave accounts in real-time. The software automatically applies trade settings to trade signals it receives such as money management, filters unwanted currency pairs, lot size per trade, and other settings within a second. MT4 Trade Copier will execute both market orders and pending trade orders on any MT4 platform. It’s really not that complicated in the end. It is somewhat like a modern-day fax machine for forex trades. Okay, so now when you know what a trade copier is and what copy trading process means, lets crush those hard-to-understand terms so you would never need to change the topic of the conversation when someone starts to talk about these. The Master Account is where you manage the trades and that sends trading signals to clients. It is also referred to as the server account or the signal provider account. The Server EA of the Trade Copier software must be installed on the master account in order to send the trading signals. You execute your trades on the master account as you normally do when trading, and the Server EA takes care of sending the trade parameters you have executed to all client accounts. The server EA is capable of delivering trades to thousands of clients instantaneously and enables every client account to receive immediate trade execution in a fraction of a second. The master account sends the exact trade parameters such as order market price, take profit, and stop loss levels to client accounts. The Slave Accounts are the client accounts that receive and execute trading signals that are sent by the master account. They are also referred to as the followers, copiers, or your subscriber/customer trading accounts. In most cases, the Client EA of a trade copier software is installed to the slave account in order to receive the trade signals that the master account has executed. A slave account can be configured to skip and not copy some trades of the master account using the trade copier software’s filter options. You can set up the slave account not to execute any trading signals of a particular currency, and not to receive any trades during a specified time period. The slave account will also automatically adjust the lot size of a signal it receives in order to comply with its risk threshold. The slave account can be set to a certain percentage risk for each trade based on the account size and the size of the stop loss. All the settings and trades will be correctly copied from the master account to the slave account no matter what account types are being used. In the context of trade copying, a trade signal is information or instruction sent by the master account to the slave account. The information contains the details of a trade made by the master account, such as the direction of the trade (buy or sell), market entry price, stop loss placement, and profit target. The slave account that receives this information sent by the master account may execute the same trade with the same market entry price, stop loss placement, and target profit. Trading signals are sent and executed by all accounts at lightning speed. Thus, all the accounts will be at the same entry price, or within a fraction of a pip generally. However, keep in mind that a delay may occur when copying trades. The copy speed usually depends on the broker and in most cases its the broker server that causes the delays to open/modify/close trades. You can watch this video to learn more about the copy trading speed. A Virtual Private Server (VPS) is an externally hosted server used to manage trading connectivity, which ensures the trading platform is running 24 hours a day. It is a special type of server which is contained on the same computer with other virtual private servers; hence it was termed “virtual” because it is not a complete server unto itself, but rather is divided into its ‘virtual’ pieces/partitions. 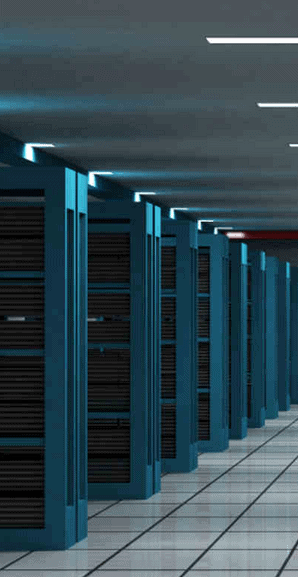 VPS hosting allows Forex traders to use a virtual space on a VPS hosting company’s server. Although all the virtual private servers of a hosting company may be located on one or more machines, a VPS operates independently of each other. The VPS hosting company gives you complete control over a slice of a server and provides you with admin access to do with it as you please. You can install an operating system of your choice, install any applications on it, and you have the control to reboot your system if needed. You will have guaranteed CPU usage, a certain amount of disk space and memory, and also a certain transfer allowance per month. It’s safe and secure since no one will not be able access your VPS except you. Your VPS has its own dedicated power supply and offers flexibility, stability, and convenience. Since the VPS is always on-line and not affected by power outages, many forex traders choose to run their Expert Advisors non-stop, 24 hours a day, 7 days a week on a VPS server. It’s a better tool than a home computer since you can run your trading platform and expert advisors continuously without any interruptions. Most forex trade signal providers run the trade copier software together with the master and slave accounts on a VPS server. In this way, a forex trading robot can execute trades on a master account 24/5, and the slave accounts can copy all the trades 24/5 with minimal or no human intervention. 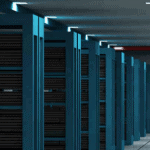 A VPS server also allows traders to gain access of their trading accounts from the server from any computer anytime and anywhere. Actually, that is exactly what I do at my trading signal business at www.vavatrade.com. I host MT4 platforms of my customers on my own VPS servers and this way they do not need to worry about any technical stuff. MetaTrader 4 hosting is the best way to provide stable availability of the MT4 platform to traders. Large brokerage houses connect to MT4 hosting companies to grant fast, stable, and secure servers to their clients. Through this way, brokerages are able to monitor and manage brokerage activities without having to bother about maintaining expensive critical servers. MT4 hosting is very much related to MT4 VPS hosting which is ideal for traders who wish to run their MT4 EAs 24/5 during trading hours, without relying on their own computers or internet connection. Most trade signal providers install their trade copier software on an MT4 VPS to ensure 24/7 trading connectivity. There are hundreds of VPS providers that you can use to host your MT4 platform. Personally I use VpsForexTrader.com, but here is the list of the on-line companies that offer Forex hosting service via VPS. If you have trouble setting up your MT4 on a VPS server you may want to check this chapter 6 in this copy trading guide. Maximum Price Deviation (MPD) is the number of pips that you allow the trade copier app to still copy your trade order, even if the actual price is different between master and slave accounts. It is one way to mitigate the risk associated with market price slippage. During high volatility periods, executions of orders are subjected to price requotes since the order price might not be available by the time the server accepts the order. This can happen a lot during major news releases, especially when you have a slow internet connection and it takes a few seconds to send your order. Since the price moves so fast, enabling the MPD feature of your trade copier software enables your order to be executed with a small difference from the current price. Keep in mind that if the price difference is too big the trade may not be copied at all. The MPD allows you to specify the amount of potential slippage for the trade copier app you are willing to accept on a market order by defining a range. If the current price is 100, a price deviation of 1 point will still allow to copy your order even if the price moves anywhere from 99 to 101. A price deviation of 2 points will still allow to copy your order even if the current price will move anywhere from 98 to 102. A price deviation of zero indicates that no slippage is permitted; your order will only be copied at your selected quoted price, not any other price. However, when a request to open an order will be sent to the broker it may still be placed at a different price because of the requotes and this depends on what slippage is used. Do not confuse MPD with the Slippage. MPD is like a slippage for the Client EA. It tells if Client EA should copy the trade or not. If the current market price on the particular slave account is within the MPD range then Client EA will try to copy it, and this is where the Slippage now will take place which will be sent to the broker server together with other parameters for the trade that needs to be opened. Slippage is the pip difference between the order price and the execution price of a particular trade transaction. Due to slow internet connection speed and market volatility, order price could change before it reaches the Liquidity Provider for execution. In most cases, in a fast-moving volatile market such as EUR/USD, price slippage is often from $.0002 to $.0005. If you ordered to buy 1 lot of EUR/USD at the market price of 1.35050, the order will be sent out through MT4 to the liquidity provider, and will be executed at 1.35055. As a result, you have just lost 5 USD due to slippage. If you are trading manually, price slippage during major new releases can be as much as $.0010 to $.0015. Trading accounts that are dependent on signal providers are very much subjected to slippage risk. By using a VPS server, this risk can be mitigated since a VPS can execute all the trade signals more quickly than a computer at home. A master account from a VPS server can also transmit trading signals much quicker as well. Currency ticker symbols that are used in the forex market represent the currency pair or instrument that is being traded. The forex pair symbol, such as the EUR/USD, denotes how much of the quote currency (USD) are needed to purchase one base currency (EUR). The base currency is in the first position of a pair while the quote or counter currency is the second position in the pair. The quote currency is the quantity of that currency needed to purchase a single unit of the base currency. Each currency symbol is composed of three letters and it represents the currency of a particular country. The first two letters signifies the country and the third letter is name of that particular country’s currency. For instance, USD is the symbol for United States Dollar and SGD for Singaporean Dollar. A currency suffix is used by some brokers to identify the trading feeds they have on certain accounts. Forex brokers deliver their MT4 platforms with unique currency pair notations, which may vary from the standard notation. The standard currency pair notation consists of six capital letters such as the EURUSD, but some brokers adds suffix to the standard notation making a pair looks like EURUSDm, similar to what you see below. Other brokers use “micro” as a suffix instead of “m”. Other account types from the same broker may have a different currency name suffix or not have a suffix at all. Some brokers use other suffix names and some do not use them at all. When using an EA, customize trading indicators or subscribing to trade copying services, currency suffixes create some troubles and these trading software may not work properly as intended. If the broker of the master account of a signal provider has currency suffixes while the broker of the slave account doesn’t use any suffixes, any trade signal sent to a slave account may not be executed. Currency suffixes are case sensitive and the trading software must be configured correctly in order for the master and slave account to synchronize and communicate trades properly. In most cases LTC and RTC copier apps will detect suffixes automatically. Symbol mapping is a general symbol name translation tool between data feeds and brokers. Because brokers are free to add a prefix or suffix to the standard forex pair notation, brokers may have different currency symbol for the same currency. The slave may reject the signal sent by the master account due incorrect symbol reference. With the use of a symbol mapping tool, it is now possible for the slave account to receive and execute any trade signal sent by the master. It helps to route the slave account’s order to the broker. With the LTC and RTC copiers, there is a simple setting that will account for any suffixes/prefixes needed to work with your broker. You can learn more about these types of features by reading the Definitive Guide for MT4 Trade Copying here. Trade Filters is a great feature of a trade copier software to filter MT4 trades based on predefined settings when copying trades between accounts. The slave account can be configured to filter the trades sent by the master account. It can be configured to reject a particular currency pair. Trade filters can be set so that both master and slave accounts will not send and receive any trades during a specified time period. This is very useful for traders avoiding the abrupt market price surge during important economic news releases. For example, it can prevent the master account, which is using Forex robot, from sending new trades during a specified time of the day. There are other filtering options offered by almost all trade copier softwares that are available in the market. With LTC you can even set the follower account to skip the trades using external trade filtering indicators. A stop loss level is the price that you set to close out your existing trade in order to limit your losses when the market moves against you. Stop loss levels depend on the trading strategy. A day trader may place the stop loss just outside of the daily range of the currency pair, while a swing trader may set his stop loss outside of twice to three times the daily range. If the market suddenly moves far enough against your trade, your account is protected from huge losses because the position is closed just before the market moves farther away against you. The stop loss level should be calculated before you place a trade. It is an essential part of money and risk management. The calculation is based on how much money you are willing to risk in each trade. Ideally, this should be limited to 2% of the account value as an absolute maximum and the risk of losses on each trade should not be greater than the potential profits. The stop loss levels typically will be copied as-is from the master account to the slave account under normal operation. Lot multiplier is a unique feature of a trade copier software to automatically adjust the lot size of a trade based on a slave account size. A certain percentage of risk can be set which would vary from one account to another, based on the account size. This facilitates the copying of trades regardless of the individual balances of the different accounts. This means that it doesn’t matter whether the master account size has a $1,000 equity balance while the slave account has $25,000, or the master has $25,000 and the slave has $500 in funds. The trade copier software will copy the trades correctly according to the settings. You can also set trade copier app to perform a lot of stop loss and take profit manipulations. This is a connection method that some signal providers use to directly connect a slave account to the master account by hosting their customer’s MT4 platforms. Through a special type of application the signal provider’s master account is linked onto the customer’s slave account directly. In this way, their customers don’t need to run their MT4 platform or have a VPS to receive signals. It is also the easiest and fastest way to set up a trade copying account. However, keep in mind that this type of trade copying is not available to anyone. MetaQuotes strictly forbids the use of any unofficial trade copier software for direct connection and the official software for this of copy trading costs big money. This is why such type of applications usually are available only from the forex brokers, because they cost really bid money to create and requires license from MetaQuotes. Also, it means that you cannot copy trades between different brokers. Reverse Trading is when you set the Client EA running on a slave account to copy all of the trades coming from the master account in the opposite direction. So basically it mean you can turn your loosing trading system or Expert Advisor into a winner. But it is not that easy as it sounds, even if the majority of forex traders and forex robots lose money. Reverse Trading in copy trading is also called “reverse mode” or “reversal copy trading”. Read more about reverse trading in chapter 8 of this guide. If this information has been very informative for you please do not forget to share it with others. I am also interested to hear your feedback and what questions you have. So please post a comment below and tell me what I missed. Which term is the confusing one for you? Did you find this information useful?